Wow, I never knew about this incident and I had to find out more details about this healthy snack that a rare, socially-responsible celebrity like Virat Kohli is promoting. A quick search in Amazon got me what I wanted - yes, the ingredients list !! 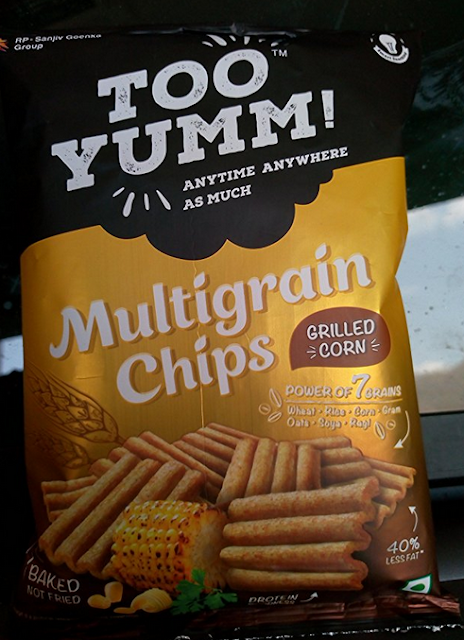 There are so many varieties of Too Yumm snacks and I have looked at “Multigrain chips - Grilled corn” flavor. The pack says “power of 7 grains” - Wheat, Rice, Corn, Gram, Oats, Soya and Ragi. I was curious to know about the percentages of these 7 grains. - Nearly 50% of it is maida + corn flour, both have no nutrition whatsoever. 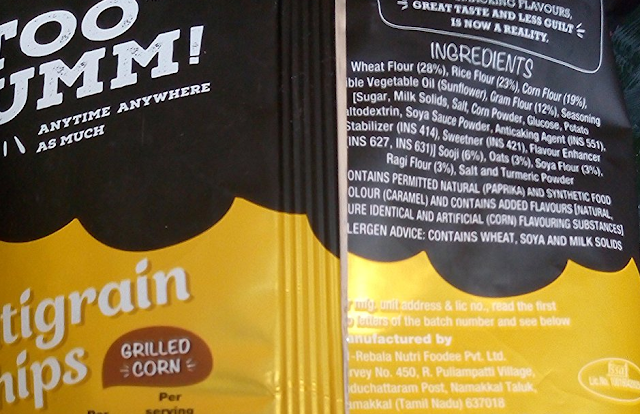 To position themselves as a “healthy" snack, the word “multi-grain” is stressed upon in their packaging and ads, but ONLY a tiny percentage of soya, oats and ragi are included. The nutrition table states that it contains a meagre 1.28g of dietary fibre in a serving size of 30gm. - A serving size of 30gm contains 270mg of sodium, whereas a 30gm pack of Lays American Style Cream & Onion contains 223mg of sodium. Is Too Yumm really a “less guilt” snack? I don’t think so. When a pack says "less fat", it always ends up either high in sugar or salt, in order to balance the taste. - What’s the need for an artificial sweetener in a savoury snack like multigrain chips? Mannitol (INS 421) is a low calorie sweetener, that is semi-artificially produced by adding hydrogen to fructose, which is derived from starch. It is generally recognised as safe by FDA, but the side effects include hyperactivity and aggravated food intolerances. - The two flavour enhancers that we came across earlier in Saffola Masala Oats and Knorr Soups are present in Too Yumm chips as well - INS 627, INS 631. To know more about these two ingredients, please check out my earlier posts. - Synthetic food colour (Caramel) is present, but the class number is not mentioned. - I’m not sure if we could consider sunflower oil a healthier choice as compared to palmolein that is typically used in all junk foods. Yes, the saturated fats seem to be lesser in Too Yumm, as compared to Lays chips. But since all refined oils are unhealthy, I wouldn’t consider this pack a “less guilt” choice. This analysis pertains to just ONE variety. Before we go ga-ga over "baked, not fried" (and just because Virat says so), let's take a moment and read through the ingredients.